Lyngen is a municipality in the Region of Troms in Northern Norway. The municipality is characterized by the towering mountains that rise 1833 metres right up from the Arctic Ocean. Geographically, the municipality is a peninsula. There are some 3200 inhabitants in Lyngen. Lyngseidet is the main settlement, and has some 1000 inhabitants. It is a rather picturesque place, with old, wooden houses and the 1731 Lyngen Church. Furuflaten is an industrial village at the root of the peninsula. Nord-Lenangen is a fishing village at the tip of the peninsula. 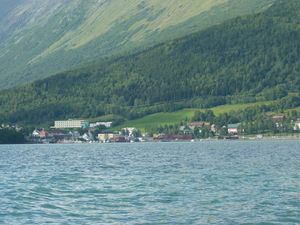 Svensby is a settlement some 20 minutes' drive west of Lyngseidet, from where there is a ferry to the Tromsø peninsula. The municipality is tricultural. The original inhabitants were the Sami. The outer villages got a Norwegian population rather early on, and in the 18th c., people from Finland settled in the area. Today, almost everyone speaks Norwegian only, but Sami and Finnish is still spoken by a few elderly people. The area is immensely suited for off-piste skiers. However, visitors will soon discover that the infrastructure is lacking. Book your accommodation early and bring all your gear, the rest the flexible inhabitants will fix on the spot. Sea fishing is excellent in the area. There are plenty of boats available to hire, although shore fishing is good too. In the deep waters of Lyngenfjord (up to 300m) you can catch cod, whiting, haddock, coalfish, halibut, wolffish, redfish (Norwegian haddock) and more, and you can see porpoises and the occasional whale. There is even pretty good fresh-water fishing in Jagervattnet, a lake north of the Svendby ferry, where you can catch salmon and arctic char, although a licence is required. The main language today in Lyngen is Northern Norwegian dialect, with slight variations within the municipality. However, some Sami and Finnish is still understood by the elderly. English is widely spoken, especially by the young. To reach the peninsula, there is a ferry from Breivikeidet in the borough of Tromsø to Svensby. The drive from Tromsø to Breivikeidet is about 50 minutes. From Svensby, there is 25 minutes' drive to Lyngseidet. From Lyngseidet there is a ferry onwards to Olderdalen on the east side of Lyngen. for updated info. Alternatively you can take the longer land-only route, following the E8-E6-Rv868 all the way round Lyngenfjord. This is the route to take if you're too early or late for the ferry. There are a couple of buses a day from Tromsø to places like Svensby, Lyngseidet and Furuflaten. The northern tip of the peninsula is served by a bus a day, approximately, and a catamaran a couple of times a week. for bus timetables. There are buses from Tromsø twice a day Monday-Saturday. Solhov folkehøgskole at Solhov, just south of Lyngseidet. This was built as a boarding school around 1920, and is a huge wooden building. If you know what you're doing, hire a hut or a room and do it yourself. Are you up to it? - Skiing by boat: You stay on board a boat, and ski with a guide during the day. Organisers include: Boreal-Yachting  and Polar charter  . The shops in Lyngseidet are more functional than designed for the shopoholic. Surprisingly there are three well-stocked supermarkets, one near the ferry, and one to the NW of the town, opposite the medical centre, with the third directly behind this. There's a small gift shop next to the first supermarket, and a hardware store on the main street that also sells fishing gear (although all the supermarkets do too, albeit to a lesser extent). There is a tourist information in Lyngseidet that sells maps, souvenirs, local food such as sirup and reindeer sausage and handicraft. If you get the opportunity, buy some freshly-boiled shrimps from one of the shrimp boats that occasionally tie up at one of the piers: they're absolutely delicious. Gourmet Lyngen sells high quality lamb meat very Friday in Storsteinnes between 12-3pm. Rompa bar in Svensby, open one Saturday a month. Book early for the off-piste season in March-May. Groups of budget conscious travellers could consider the top end alternatives, as they get less pricy if many people share. Svensby Tursenter Camping and cottages. Magic mountain lodge Singlerooms, doublerooms and bunk beds. Svensby tursenter has got three huts with bath and lounge/kitchenette, along with two bedrooms. Magic Mountain Lodge has rather nice rooms centrally located in Lyngseidet. Toften Husflid og Ferie is in fact a single house that easily sleeps four. Lovingly restored, it combines character with comfort. Lyngseidet Gjestegård single and double rooms in central Lyngseidet. Koppangen Brygger is a resort geared for deep sea fishing. The huts sleep many people, and have all equipment necessary. The location in Koppangen north east of Lyngseidet is magical. Lyngen Havfiske also caters for the deep sea fishing set, and is equally well equipped. It is situated in the middle of the fishing village of Nord-Lenangen. Sorheim Bryggeis similarly a group of chalets targetting fisherfolk. These are extraordinarily well-equipped, with sauna, smoke house and WiFi, and you can rent a boat and fishing gear. Lyngen Home A house 1,5 kilometers from Lyngseidet. Lyngen Fjordcamp A house in Nord-Lenangen just by the sea. Astrid's holiday house A traditional norwegian house 11 kilometers from Lyngseidet. Take me Away-house A holiday house in retro-style 12 kilometers from Lyngseidet. Solheim Frtidsgård A house next to a farm in Svensby. Kjelkebakken Gård A house on a farm 2 kilometers from Lyngseidet. Crime is more or less unheard of. The main danger is also the big attraction: The mountains are highly dangerous for the untrained. If you should hire a boat, always wear a lifejacket. The weather can change surprisingly quickly and it's not uncommon for the wind to change from a gentle breeze to a gale in minutes, so be prepared. This page was last edited on 4 April 2017, at 12:26.